Home builder confidence held firm this month, according to the National Association of Home Builders’ monthly Housing Market Index. September’s reading of 13 equaled a 17-month low. The HMI is on a 1-100 scale. A value of 50 or better indicates “favorable conditions” for home builders. 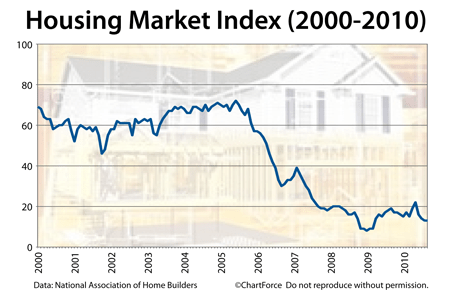 Broken down, the Housing Market Index is actually a weighted composite of 3 separate surveys which measures current single-family sales; projected single-family sales; and foot traffic of prospective buyers. 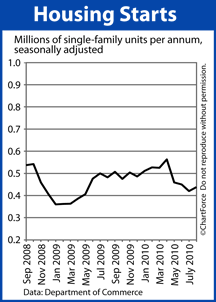 Builder confidence is lower in 2010 than at any point in recorded history. For home buyers in Coto de Caza , the drop in sentiment creates opportunity. With builders feeling “down”, there’s a greater likelihood for discounts and free upgrades. It can mean more house for your home buying money. Plus, with the supply of both new and existing homes elevated, and foreclosures still hitting the market, conditions aren’t soon likely to change. Then, couple all that with all-time low mortgage rates and monthly housing payments look as affordable as ever. 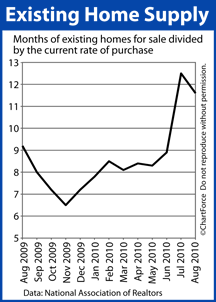 If your plans call for buying a home in the early part of 2011, you may want to consider moving up your time frame. Today’s market looks ripe for a good deal. 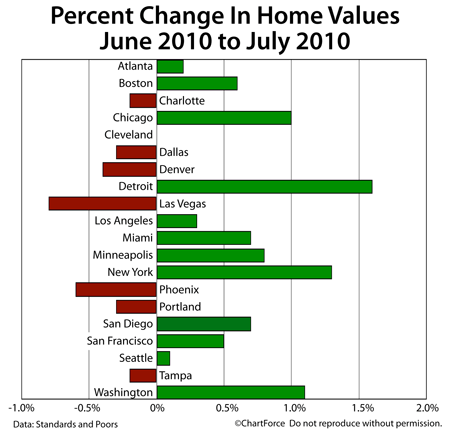 As a spokesperson for Case-Shiller said, values “crept forward” in July. But not that it matters — the Case-Shiller Index is a better tool for economists than it is for homeowners in Coto de Caza. This is for 3 reasons. With New Home Sales fading and colder months ahead, it may be an opportune time for home buyers in Rancho Santa Margarita to look at new construction. 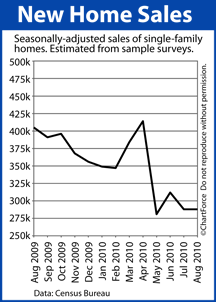 Builders are eager to move inventory and the cost of materials remains low. Mortgage markets improved last week as markets digested a bevy of data from the housing sector, plus the scheduled Federal Open Market Committee meeting. In back-and-forth trading, conforming mortgage rates in California bottomed out Wednesday before rising through Friday’s afternoon close. Rates still managed to eke out improvement on the week overall. If you’re still floating a mortgage rate or have yet to commit to a refinance, consider that mortgage rates are primed to rise. They’ve been falling for 22 weeks and when the market turns, it’s expected to turn quickly. Talk to your loan officer about your refinance options while mortgage rates are still low. As compared to July, Existing Home Sales rose 8 percent in August, buoyed by falling interest rates and slow-to-rise home prices. There’s lot of “good deals” out there and home buyers in Rancho Santa Margarita are taking advantage. For home buyers, the data presents an interesting opportunity. With average mortgage rates rising from their best levels ever and home affordability cresting in places like Orange County , this autumn may represent the turn-around point for the housing market nationwide. If you’re planning to move in early-2011, consider moving up your time frame. Now, it’s not that the news is wrong, per se, it’s just not necessarily relevant. Few home buyers in Coto de Caza are buying multi-family homes or entire apartment complexes. Most buy single-family and, for the first time since April, single-family starts are on the rise — just not by as much as you’d believe from the papers. The Best Home Buying Season of the Year! Have you been sitting on the fence, considering buying your next home? If you’ve been reading my newsletters or blogs for at least the past couple of years, this is just a refresher course. If you haven’t, this would be a good time to look a little closer. In Southern California, the last quarter of each year is usually the best time of the entire year for a home buyer to get serious – for quite a few good reasons. First, the inventory of available homes typically creeps up after summer, and this year is no exception. So, more houses to choose from. Second, the majority of buyers have ALREADY made their move. They wanted their kids to be in school come the end of summer, or a variety of other reasons. So, there is less competition for the houses that become available – in practically every price range. Third, as we approach the Holidays, there will be even fewer buyers out there, because they’re distracted by the season. Fewer buyers translates to more unsold houses, AND more sellers who are increasingly anxious to get their houses sold before the Holidays, so that they can relax and enjoy that special time of year. This year there is a new reason to buy now – the lowest interest rates on record are still around. So, houses are more affordable this year, than they’ve been in probably a decade. It appears to be a veritable perfect set of conditions for a serious home buyer. But what about the poor economy, you ask? I suppose you’ve heard that there might be a “double dip” in housing, on the horizon – where prices will have still another substantial drop. If you Google double dip you’ll get a LOT of articles predicting such an event, but if you check out the dates of the articles, and look for the most recent ones, you’ll notice that more and more people in the know are starting to predict that a double dip isn’t very likely – especially in Southern California. Oh, you’ve also heard about the alleged “Shadow Inventory”, an impending Tsunami of foreclosures coming soon, which will severely impact home prices, as well? Again, more and more people in the know are coming to the conclusion that THAT event isn’t going to happen, either. Of course there are more foreclosures on the way, but it now seems as though their numbers, and their impact, will be similar to those of the last year and a half – more of a trickle, than a Tsunami, and easily absorbed by existing ready, willing, and able buyers. In conclusion, if you are getting serious, but have been thinking that YOU might wait until after the Holidays, let me remind you that the home buying season in Southern California begins almost every year after January 15th, and that the following 4 or 5 months is the BUSIEST season to buy. More buyers, competing with you – resulting in fewer properties being available to choose from, which usually results in prices nudging upward, and a potential for multiple offers on the nicer of the houses remaining available. Add to those reasons, the very real possibility of higher interest rates. All good reasons to avoid that Spring time busiest time of the year – and to consider getting serious right now. I’m available now – let’s go home shopping! Comments Off on The Best Home Buying Season of the Year! There were no surprises in the Fed’s statement so, as a result, the mortgage market’s reaction to the release has been neutral. Mortgage rates in California are thus far unchanged this afternoon. Note that the Feds Funds Rate is not “a mortgage rate” — nor is it a a consumer rate of any kind. 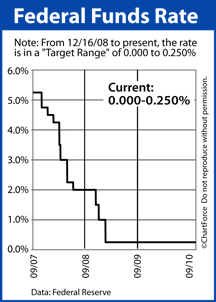 The Fed Funds Rate is a rate that defines the cost of an overnight loan between banks. 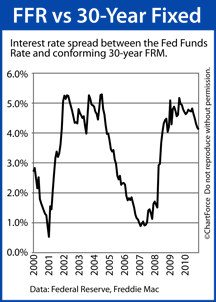 And, although the Fed Funds Rate has little direct consequence to everyday Coto de Caza homeowners, it is the basis for Prime Rate, the interest rate on which most consumer cards are based, plus many business loans, too. If you’re actively shopping for a mortgage, it may be prudent to lock your rate ahead of the Fed’s announcement today. The Fed adjourns at 2:15 PM ET. Call your loan officer to lock your rate. 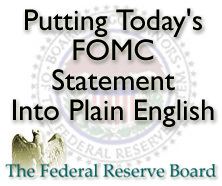 Comments Off on The Federal Reserve Meets Today. Should You Lock Your Rate Before It Adjourns? Mortgage markets were highly volatile, yet relatively unchanged last week in back-and-forth trading on Wall Street. Global investors are grappling with the state of U.S. economy and unable to discern whether it’s growing, or slowing. As an real-world illustration, the government’s August Retail Sales report showed strong growth nationwide. However, in looking at a subset of that same data that accounted for rising gas prices, and excluded automotive-related sales, the results were far more tame. Last week, conforming rates carved out a range close to 0.375 percent, making it difficult for California rate shoppers to zero-in on pricing. 30-year fixed rates worsened, 15-year fixed held steady, and ARMs improved overall. That’s one housing-related release per day, and a Federal Reserve meeting to boot. Today’s low rates could be vanished by Friday. Therefore, if you haven’t already, it may be time to call your loan officer for a refinance. 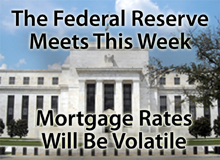 Rates could certainly fall further, but they’re looking more likely to rise.